London’s restaurantland never ceases to amaze me. There’s always somewhere new to try and the standard of food seems to get higher and higher. In my explorations of Covent Garden I often roam into Chinatown and feel transported to another land. The aromas, sights and sounds envelop you and your mouth starts watering. It’s a classic part of London that I always love taking guests to – usually for large portions of crispy duck with pancakes and all the trimmings. We’ve polished off our share of ducks in those bustling restaurants! Today I’m right on the edge of Chinatown eating in a fabulous new discovery, really new, it had only been open two weeks when we visited. 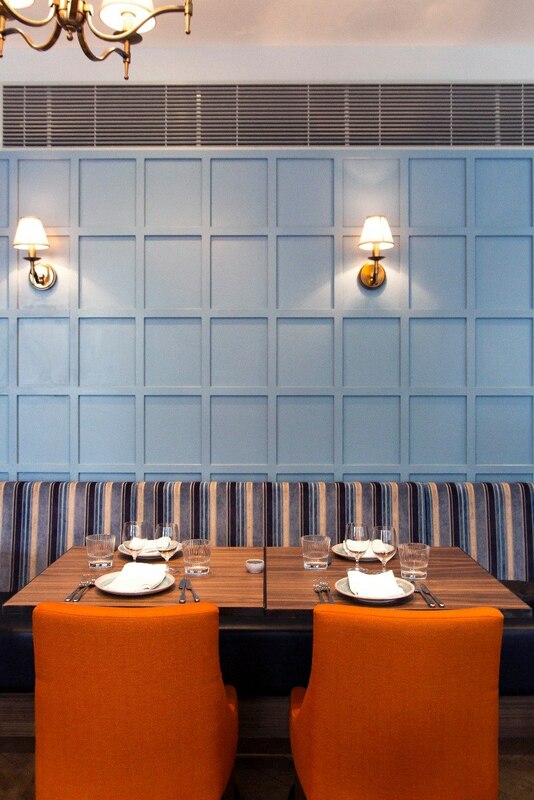 The Restaurant at Leicester Place serves Vietnamese-French food tapas-style. It’s a beautifully stylish and cosy space packed with Georgian charm (love the wooden panelling) and history. Karl Marx and Johann Strauss stayed here – and you can too, as it’s also a boutique hotel. I love tapas-style eating and I love Vietnamese food, something I’ve been discovering more about in recent times. So let’s say I was excited, especially having perused the menu on line – I can’t help myself. Our waitress was lovely, friendly and helpful with recommendations and explaining the format. We ordered dishes from the Crustacean and Small Things and To Serve with sections. There’s also a section called Bigger Dishes. Portions were pretty generous and this spread was plenty for two of us. 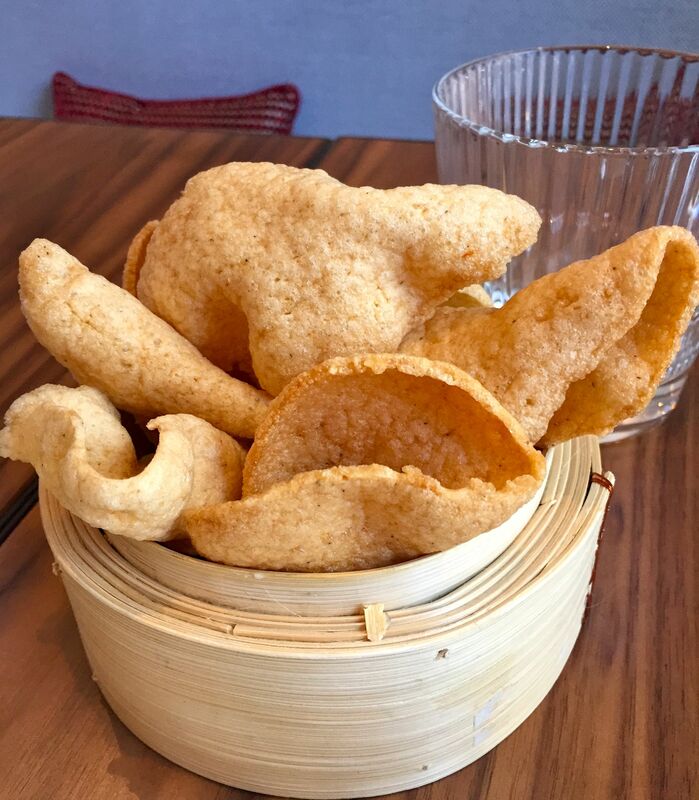 Oh, first up a delectable bowl of prawn crackers to nibble on while you wait and ponder the menu. We were clearly in a fishy mood today, with three seafood dishes – all great choices, an amazing combo of flavours and textures and the freshest of ingredients. 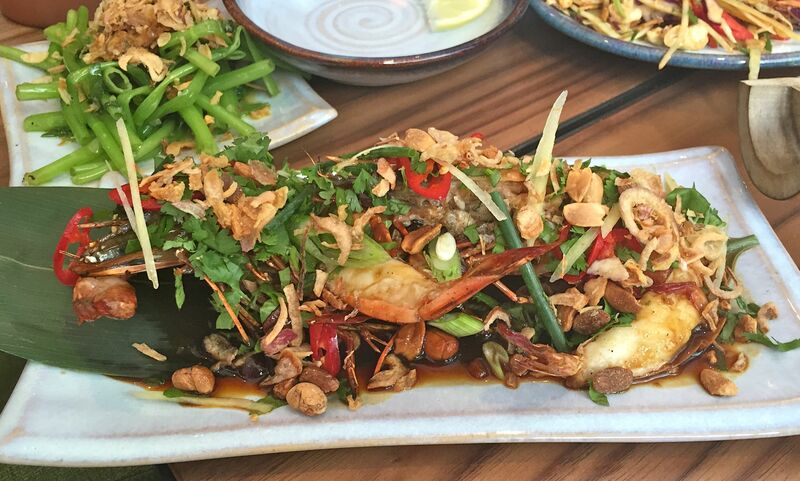 The grilled tiger prawns were served with crushed peanuts and nuoc cham. Substantial, succulent prawns with beautifully zesty accompaniments. The crunch of the peanuts finished the dish off perfectly. I demolish green papaya salad by the bowlful when I’m in Thailand. I love it’s zesty crunchiness and the touch of chilli – it tastes amazing and always feels like you’re eating health on a plate. 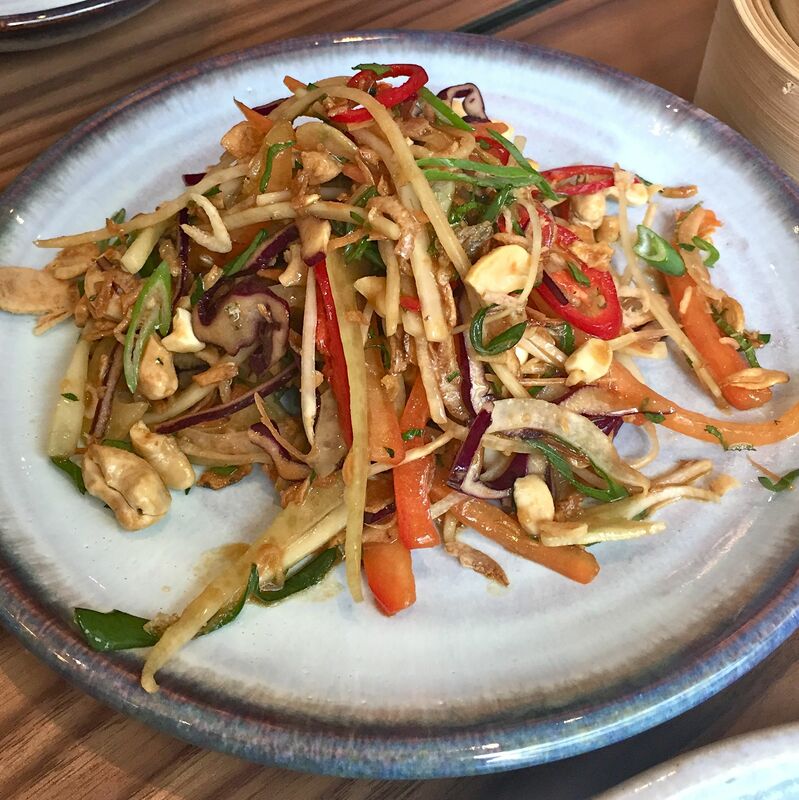 This Vietnamese version – green papaya, daikon and cashew slaw was just as lovely. 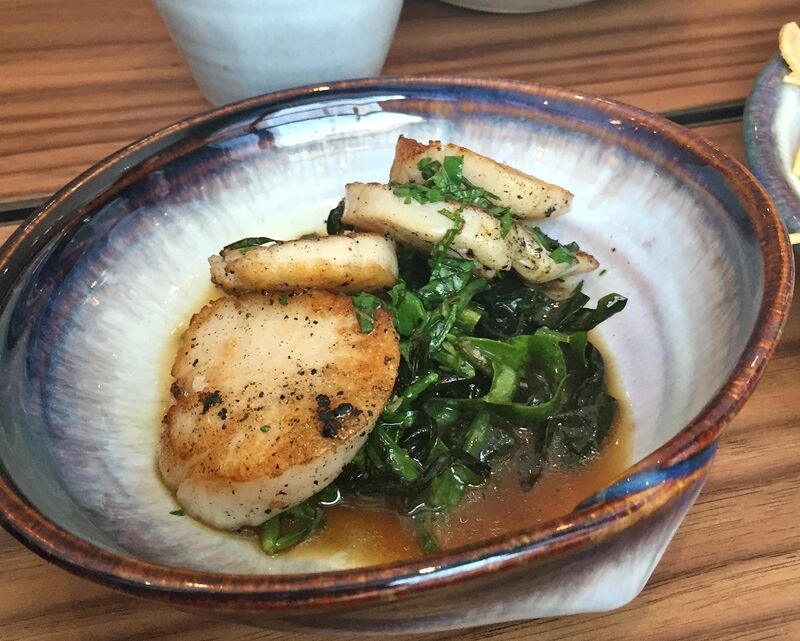 Tender, sweet scallops were served with seashore vegetables, mirin, herbs and bone broth. Melt-in-the-mouth with the perfect balance of the flavours of the sea. This amazing squid dish was a revelation. 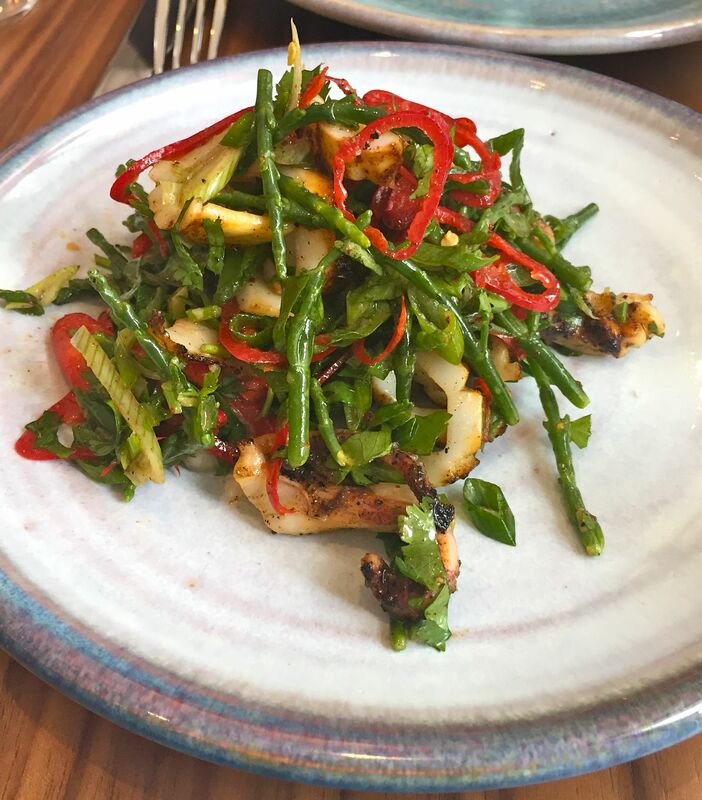 The softest of squid blackened on the grill with an amazing lime and chilli dressing and crunchy veg. Oh the flavours. 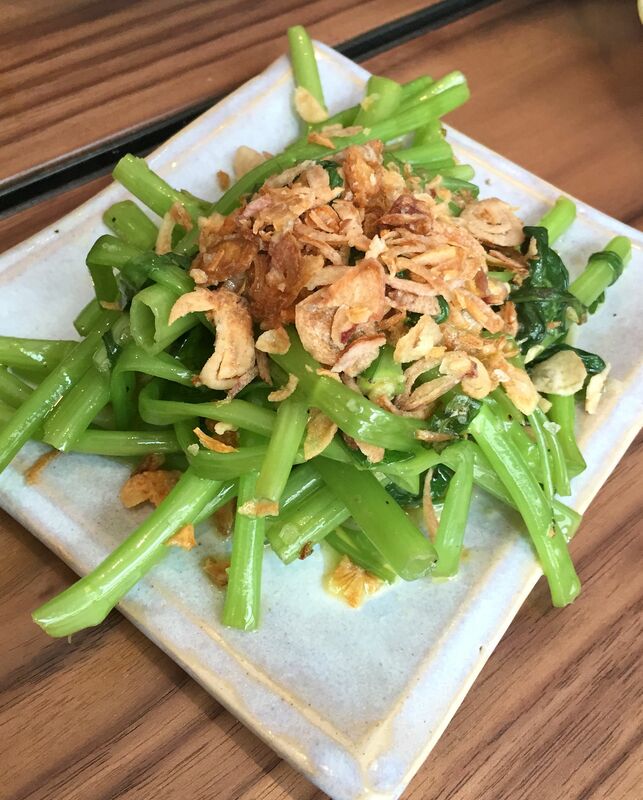 Our second side dish was the wonderfully simple steamed ong choi with garlic and crispy fried shallots. 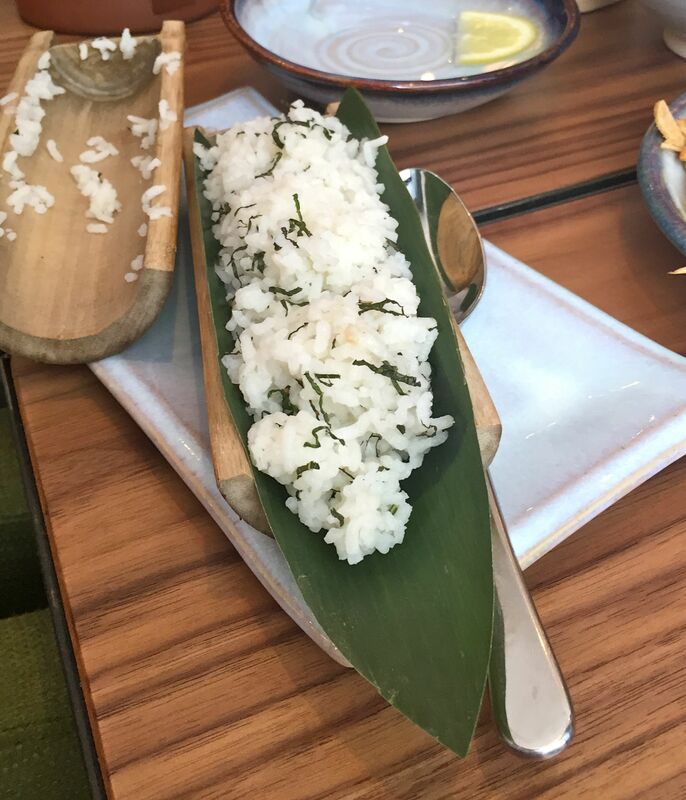 Our waitress recommended we try the coconut rice which was served in a piece of bamboo. Love it. A thoroughly satisfying lunch in lovely surroundings. Oh, the coffee is really good, too. And you can take an amble and check out the sights of Chinatown afterwards. Here’s a shot of the enticing interior. Leicester Place is at 1 Leicester Street, WC2.